Riverside County begins 2019 with a sanctioned cannabis industry. As of Dec. 26, 2018, the county began accepting applications for distribution, manufacturing, testing and wholesale nursery facilities within the unincorporated areas. The first step in obtaining a county permit is the submission of conditional use permit. Also, each enterprise must have an appropriate state license. 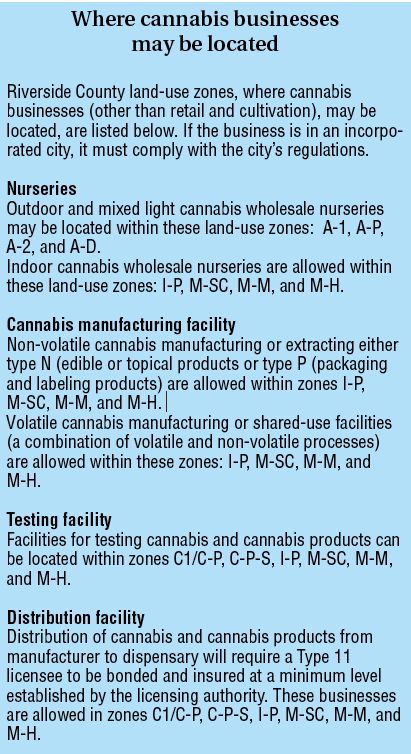 Much of this information can be found on the county Planning Department’s Cannabis webpage at https://planning.rctlma.org/Cannabis.aspx. The initial deposit for a CUP review is $9,646.14 with another $471 for the environmental review. Applications for growing and selling cannabis, including microbusinesses, are not being accepted yet. The county is preparing a different application process and will issue only 19 retail permits and 50 cultivation permits in 2019. The process for approval of permits for these activities, which will involve responding to a request for proposals, is expected to begin in February. Another part of the permitting process will be a development agreement between the county and the permittee. This will be negotiated during the application approval process. The Planning Commission will review each permit application before the Board of Supervisors accepts the development agreement. Both the commission and board will hold a public hearing before granting approval. If a proposed operation is not located within an approved land-use zone, a change of zone application also will have to be filed along with added costs. A change in zone will require a minimum deposit of $3,648.54. To report cannabis businesses operating illegally in the county’s unincorporated areas, contact the Riverside County Code Enforcement Department at 951-955-2004 or code@rivco.org.